The spirit of the Boston Marathon can’t be measured in a single day, even if that day is Patriot’s Day, which commemorates the Battles of Lexington and Concord on April 19, 1775, the first military engagements of the American Revolutionary War. Thus, the post-race celebration would always run over to at least the following day — though often much longer. And for many that would include a pilgrimage to the Bill Rodgers Running Center at Quincy Market in the shadow of Faneuil Hall where so much of the Revolutionary fervor had been stoked. Down in the lower level of the store a small black & white TV replayed the marathon coverage from the day before, while four-time champion Bill and a guest would sit at a small table and sign books and posters for hours on end. Weaving through the serpentine line that snaked from the upper level of the store, Charlie Rodgers and assistant manager and childhood friend Jason Kehoe, along with the odd tribe of employees and friends that defined the store, served the actual customers not there simply to share a word or take a picture with the American running icon. 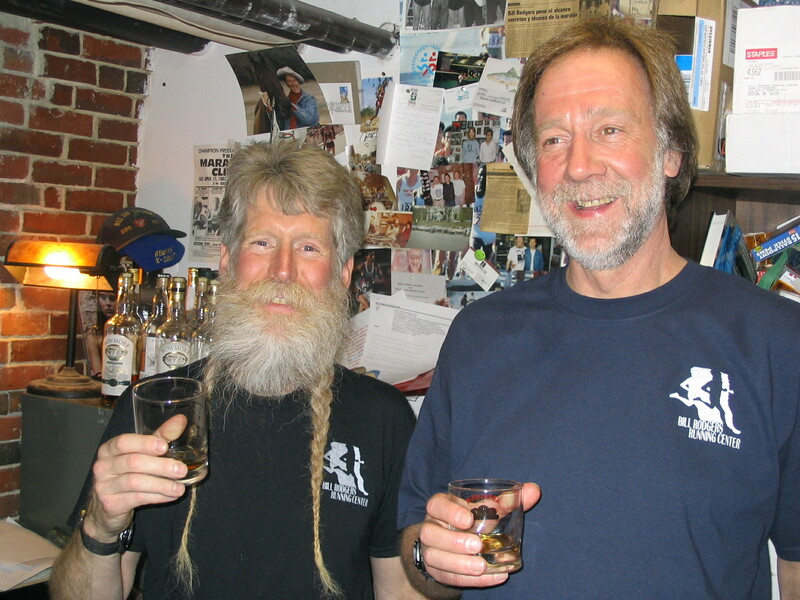 Bill’s older brother Charlie, being a single malt whiskey aficionado, jokingly referred to the Tuesday after the Boston Marathon as “International Drinking Day” at the Bill Rodgers Running Center as friends of the store from around the world would also stop by to say hello and drink in the running lore that layered the walls. Upstairs, former Soviet Union marathon national team member Yuri Laptev would set up a card table offering Russian nesting dolls and sports memorabilia pins. Every hour or so Charlie would call for a “wee dram” as the labors of retail would halt, and the boys repair to the cluttered office out back where Charlie’s collection of single malt whiskeys sat impressively atop a battered old filing cabinet. In the fall of 2012 the store closed after a 35-year run. The sudden passing of assistant manager Jason Kehoe that June served as the catalyst, but the store’s heyday was behind it in any case as newer, slicker operations opened around town and on-line to replace the hands on, analog way of doing business. 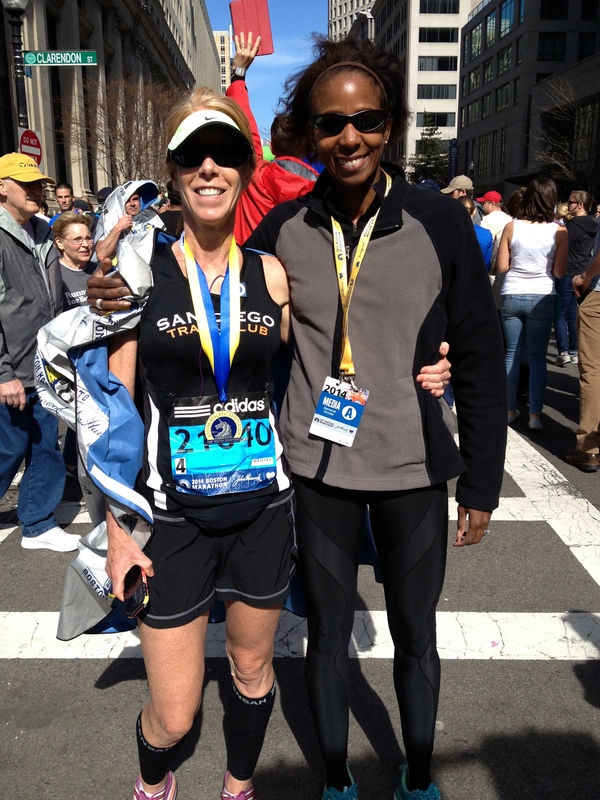 This year, the day after Meb Keflezighi’s emotional win on Patriot’s Day, Toya and I met our San Diego friends Rick and Marla Nelson at Quincy Market for a celebratory lunch following Marla’s sub-4:00 performance in her first Boston Marathon. Toya had coached Marla to her qualifier and Boston run, and it was a fine celebration at Ned Devine’s, one of the brick-walled eateries inside Quincy Market. 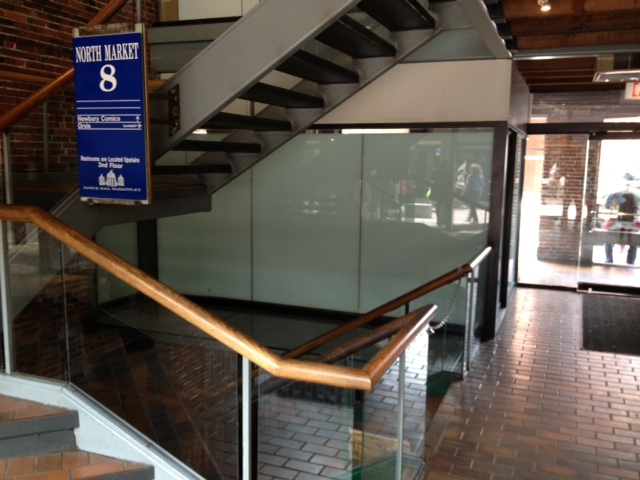 Afterwards, I drifted over to the North Market building where Bill’s store had held forth for so long. There I was saddened, yes, as windows that were once spread with running pictures and posters were now covered in plain white paper. 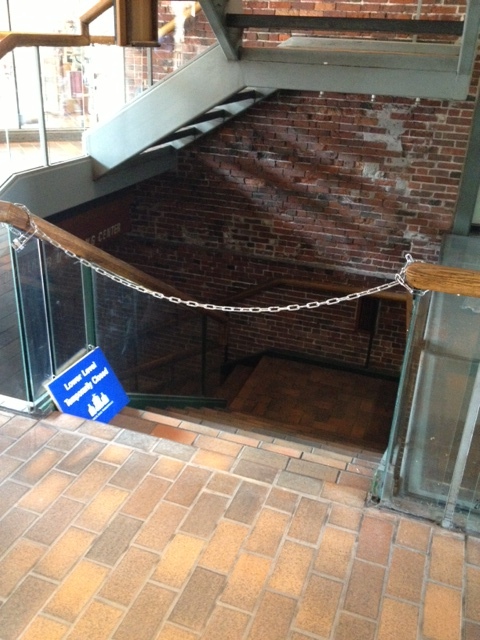 The hall and stairs that once teemed with marathoners now lie vacant and hollow. But seeing that no new business had taken over the space heartened me, as well. Seems the period of mourning continues for the old space. Perhaps it should stay this way, a reminder of a moment in time when running still ruled, and Bill remained King. Maybe Meb might be considering an expansion east. visit of this webpage; this weblog carries remarkable and actually good stuff for visitors. A group may or may not have gathered on Tuesday in that very lobby and raised a wee dram or two to Jason and others. Toni great shots of the old gang. I spent many great hours in there next to the “wall of shame” and sharing some single malt with Charles A, Jason and Billy! Thanks for sharing! That vacancy screams, ever so quietly but insistently, for a museum. The store was more of a museum than a place of business as time went on. Part of its charm. I think the BAA is at least bouncing the idea of a museum around these days. Since we’re diving into nostalgia here…Back in the early 80s it was a rite of passage to work at one of the BRRCs, much as it seems to be here in Boulder these days with the Boulder Running Company. My first year out of Boston College I shared a house with Doug Sweazey and Jason, who at the time were helping manage the Faneuil Hall and Cleveland Circle stores, respectively. 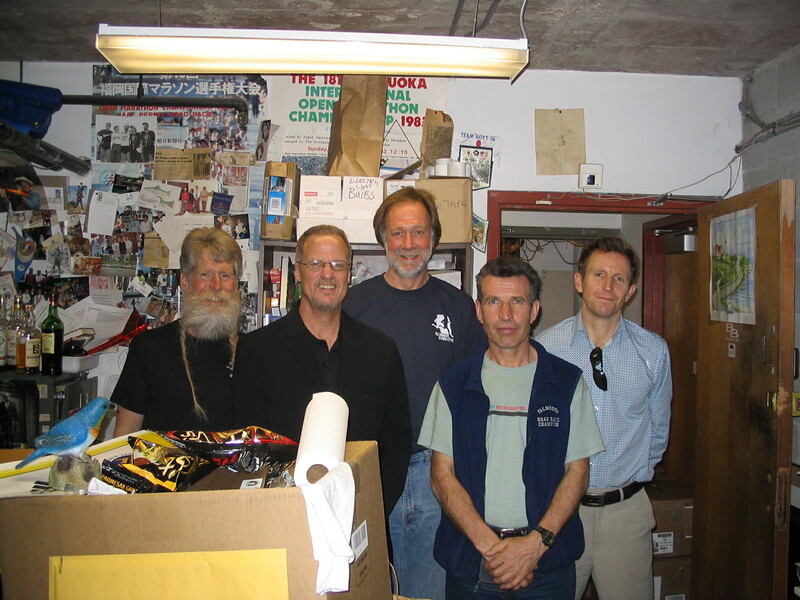 I picked up the odd shift every so often when they were running short of staff, including Boston Marathon weekend one year when Doug and I ran five or six miles to the Faneuil Hall shop through a snowstorm that came through town on the Saturday or Sunday before the marathon. I had a chance to speak to Bill in Hancock’s athlete hospitality suite Tuesday morning, but was disappointed I didn’t get to cross paths with Charlie this time around. Didn’t see Charles A. either. Only a few waves at Will-Ha. As always, he seemed to be having the time of his life. Ah, Toni… In the late 70s and throughout the 80s, I made many a pilgrimage there myself. I still have some of the plastic bags, bumper stickers, t-shirts, and other assorted memorabilia from my visits hung on the walls of my running room at home. I wish I could still visit that mecca! As a wee lad, my grandmother would take me to the Left-Handed Store in Faneuil Hall, but even before I began running, I always admired that odd little shoe store with all the pictures run by the man with the beard-braid. Soon after did I come to appreciate its significance. Tip of the (Elliot Lounge) cap to you, BRRC. Great article – I had no idea that they closed. Thanks for keeping the memory alive. Thanks for the memories, Toni, as always. As a Boston area runner since mid 70’s (Bill winning in ’75 was my catalyst) we always thought the BRRC would always be always there, but now no more.